Huge infested barbarians that populate Blighttown. They pack a punch, but most of their attacks can be easily avoided. The ones carrying boulders are more dangerous and difficult. Charged up forward stroke - Can be easily avoided, the barbarian will charge up a powerful forward smash with his club and his guard will be open for a long time. Double swing - Swings his club to the right and then to the left. Smaller range than the charged up forward stroke and less damage, easy to block. Overhead Pound - Brings the club up over his head with both hands and smashes it to the ground. Easy to block or avoid as it has a wind up time, also leaves him open to attack. Roar - They let down their guard, and just roar. The roar does no damage, but will cause other nearby enemies to join the fight. 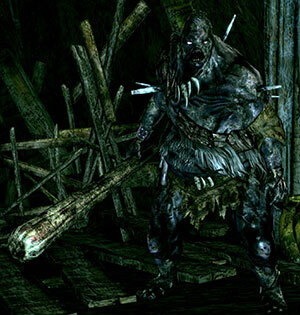 However, given the way enemies in Blighttown are positioned, most of the time those in range of the roar are already dead or fighting you, so this is your best time to get in a few attacks. 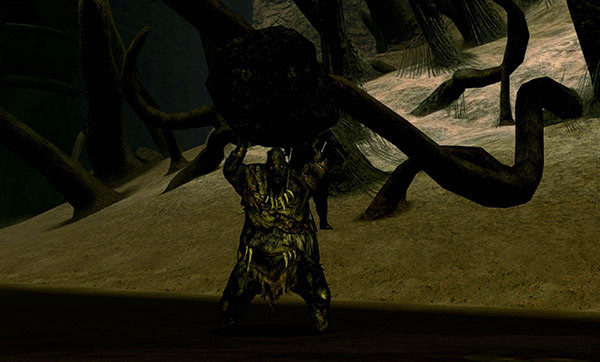 Boulder throw - They pick up a boulder from underground (yes, they have an unlimited amount of boulders) and throw it at you from a distance. Boulder dash - They dash forward with the rolling boulder. This is nasty, as it's a pretty fast and devastating attack, so try to roll away. Boulder slam - Melee attack. They lift up the boulder and smash it down on you. This deals a lot of damage, but leaves them open for attacks. Not much to say about those Rhinos. They are extremely powerful and poisonous, but have a very low rate of attack (so getting poisoned is not much of an issue with them). However brutish they are, their attacks can be blocked with your shield, so keep looking at your left hand and you should be A-OK. They also attack slowly and are easy to backstab. You should probably attack them one at a time too. 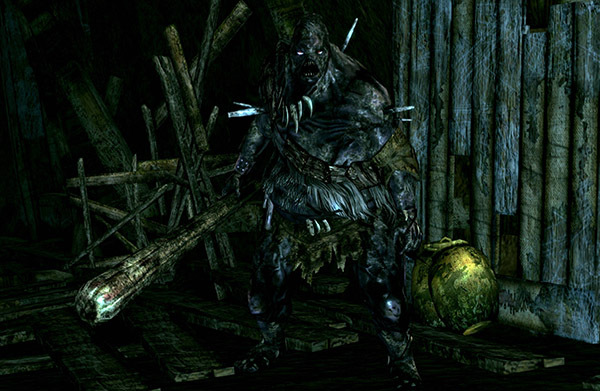 There is one trick concerning them in the game, though : if you enter Blight Town through the Depths, you will meet the first one of them on a bridge that is a little narrow for your killing. Try cowering out of this trial by arrowing his face (they are not overly mobile). Also, Blight Town Ghouls are often in the vicinity of these enemies. it might be best to kill the panzer division first, and then deal with the big headed walking corpses. The Lifehunt Scythe is very effective in taking out these guys. Two consecutive hits (two-handed) from the Lifehunt Scythe will bleed them, and take away half their health instantly. So, if the first hit takes away 1/4 (or more) of their health, the second hit will kill them, whether they have 800 or 2000 hp. Any other weapon that causes bleeding also works great on these guys, although none are as vicious as the Lifehunt. Undead Rapport can be used to make these guys fight among themselves. Give the last one standing a backstab as a reward. 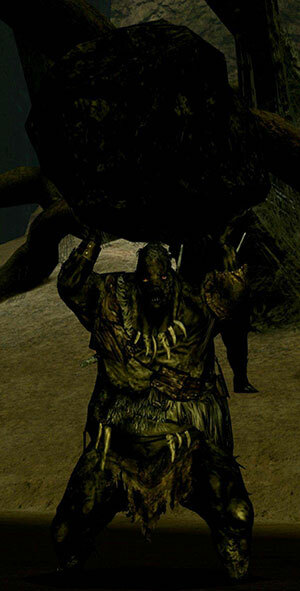 The first ones encountered in Blighttown, through The Depths entrance, can be forced to fall to their deaths by retreating to the ladder after getting their attention. Climbing back up the ladder and waiting on the platform above will sometimes lure the barbarians over the edge. If they don't fall by the time they reach the ladder, the player can reposition themselves slightly and bait attacks from the barbarians, getting them to swing, miss, and fall. Similarly, the three encountered near the entrance/exit to the Valley of Drakes can be defeated the same way. You simply need to get their attention, then run to the first ladder going down into Blighttown and climb a few rungs down. The Barbarians will chase after you and fall off the edge. You can sometimes pick up their loot by climbing back down towards the wheel elevator. You will probably have to force them off the edge one at a time by running back through the tunnel, getting the next one's attention, then sprinting back to the ladder.